I think the bombing in 1993 was the first part of the 9/11 plan. If I recall correctly, 350 tenants were relocated within lower Manhattan immediately after this event. I very much doubt that any new genuine leases were signed. My only experience of visiting WTC was in 2000 where I was refused entry at the lobby to visit WOTW as the time had passed 430 and shorts weren't permitted when the Business community were leaving the building. The strange memory I have now is how quiet the lobby area was, seemingly free of the purported 25000 business people that inhabitated each tower. I have been a visitor in other tall office buildings and the reception/lobbly areas are always bustling places. Only New Yorkers will be able to vouch for seeing thousands of office workers streaming out of the towers by 2001. The fact that 9 years later none of the ten million square feet of office space has been replaced, suggests that the theory of the towers being predominantly empty is correct. There isn't exactly a clamor to get more office space in that area. More like a bunch of swarming business deals trying to create another humongous failure for fun and profit. Great stuff! You're right if a company loss that many employees we sure didn't hear about any effects to their business did we. Wow you just made me realize something I completely overlooked. Not only Vicsims to inflate a death toll to sell people on our foreign and domestic policy but vicsims, to have fake employees on VACANT FLOORS so they could rig the building for explosives in the first place! That's genius! BTW, what do I say to the shills and naysayers who say that there would be too much security for them to add explosives? I usually try to tell them that it's not exactly like they would walk in with big boxes that says "ACME" on it. And vacant floors would make this even easier. And great points people have brought up about the leasing. And 93' being a pre-text to give them the window of opportunity to remove tenants and add explosives I can't believe I never thought about that. And it all coincides with the Hollywood Synchronicity and Dollar Bill timeline which is of course the back of the dollar bill trick and all the subliminals leading up to 9/11 started around that same time. You guys just blow my mind with this stuff. Especially Fred, I remember when he explained the concept of "backstopping" so brilliantly to me like a year ago. Do you guys think there is any way through the Freedom of Information Act we can expose these perps by showing how vacant those buildings were? Wouldn't the Port Authority or someone by law have to submit documentation for who was leased during those buildings on all those floors? Or perhaps the perps are so paranoid about that they've already "backstopped" that if you will. And of course with "vicsim" esque identities they would get away with it wouldn't they? At the very least you guys have done enough to explain to a layman how TV Fakery and NPT and whatever they did to blow those buildings up is PLAUSIBLE. Vicsims, WTC 93 as pretext, and all the articles foreshadowing live video manipulation. You know what else makes sense after all these years? I now recall on 9/11 that we were sold on the idea that people just went back to work after the North Tower caught on fire? Are they kidding us with that? We're supposed to believe people suspect a plane just crashed into a neighboring building that is engulfed in flames and people in the neighboring building, just went back to work? LOL who the heck would do that? Of course I bought it just like the rest of the gullible public because I gave the media and the government the benefit of the doubt because I had no idea the depths of deceit and destruction they have had in the present, the past, and for the future. So really if I think about it, at the very least it should be feasible for me to believe at least one of the towers had to be completely empty. Even though I bought the original story I know I was always thinking I know I wouldn't just sit there in a building while the building I can see from my window is completely on fire. If anything I'd use that as an excuse to take a day off. And it really couldn't be called an excuse could it? I'm new to this forum, though I'm not new to September Clues nor any other 9/11 research. ATTC wrote: How can you compare a demolition job that everyone knows is a demo job so far in advance that they even bring their cameras to watch, and what happened on 9/11? When on 9/11, were any parts of the twin towers evacuated? Is there any evidence that people were not allowed to go to their working space? Or did companies in advance send their employees away? I pretty much go along there with ATTC. Any other controlled demolition is of course announced to the public, the "controlled demolition" on 9/11 wasn't (well ye, of course). I guess the twin tours somehow had a "securitygate" in the lobby you had to pass (I might be wrong there) but if this was the case anyone who worked there would have realised that on 9/11 no (or just a few) people went to work. Also I would like to ask you, Simon Shack, if anyone contacted you that pretended being a family member of a victim? regex wrote: Or did companies in advance send their employees away? Do you have any evidence that the WTC included ANY companies (with any real employees) at all in the period immediately prior to 9/11? If you do, we would all love to see it. Thanks. Nope I don't have any evidence. But can you imagine that the WTC complex is like a dead city? Noone entering/leavin the towers. Wouldn't this be a bit too obvious? Well, the lack of my imagination is just because I don't live near a city as big as NY and I haven't been in a city like that before either. But I seriously can't imagine a big building with such economic importance (at least media says so ) with closed doors, the whole day. What's with the tourists anyway? I know the wtc was not open at that time for tourists but saying that there were absolutely NO employees in the buildings makes it impossible to run a restaurant at the top of the wtc. A friend of mine has been in NY just a few months before 9/11 and well, there's nothing weird he could tell me about the towers. He was also at the top of the wtc. Was that empty too? I pittily do not have the resources to make a detailed research but there has to be any evidence that this restaurant was run by existing people and not by shills. Someone has to get the food there, financial documents (since they pay taxes) and so on. If your friend was employed by a company based at the top of the WTC at the time of 9/11, be it in WTC 1,2,3,4,5,6,or7 it would be good if you could tell us the name of the company your friend worked for, which WTC building he worked in, & how he survived 9/11.. There is no evidence that the Towers were even occupied at the time, let alone "Windows to the World" being open for business as usual. 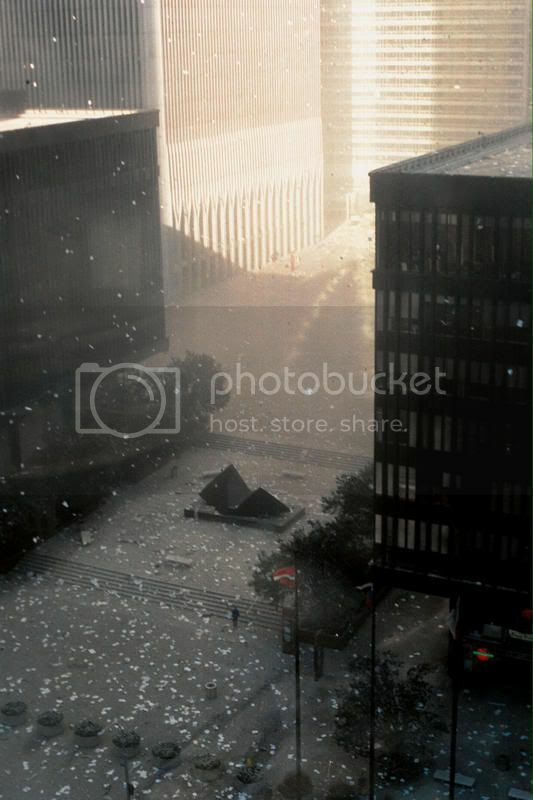 But 1 photo taken from the nearby Millenium Hotel that appears to be have been taken outside of the criticle time frames, does indeed show a deserted WTC concourse, that should have been at it's busiest. My friend didn't work at the wtc, he was just at the "Windows to the World" a few months before 9/11. But how could they run a restaurant with fake people? Or do you think that the employees were just fired the day before 9/11? I guess those people would have been the luckiest ever. My friend was there, everything was just as you and I would expect it. A normal restaurant with normal people and tourists. What happened to these people on 9/11? The picture you show has probably been taken right after the collapse of the first tower, so I wouldn't expect any people standing there. Or would you stay there when a freaking big building just comes down in front of you? The only person I see on the picture is pretty strange though, looks like he's kinda transparent. Haven't analysed it but I think you can see the stairs through that guy. regex wrote: My friend didn't work at the wtc, he was just at the "Windows to the World" a few months before 9/11. Id say the odds of this picture being taken after the first collapse is 0%, considering there would be crap everywhere not just paper. Plus you wouldn't be able to see the sun. So maybe all the firefighters took a break? According to the guy who took the photo, it was taken 2 minutes after the first hit. So lets get this clear, your friend ate at "Windows to the World" a few months before 9/11. I don't know when it was closed down. But it was critical to the narrative of the official story for it to have been perceived open, so as to have hosted the Risk Waters Conference, with all their dead vicsims. The fact that the "falling man" worked there illustrates this. Why don't you try & find some ex employees who worked there in 2001. You could start by looking at what Trade Union they would have been members of.